UPDATE, 3 P.M. WEDNESDAY: The motion was withdrawn and will not be considered at Thursday's Board meeting. We posted the newly released Alternatives Analysis (AA) yesterday for the SR-710 project that aims to improve traffic in the area near the gap in the 710 between Alhambra and Pasadena. 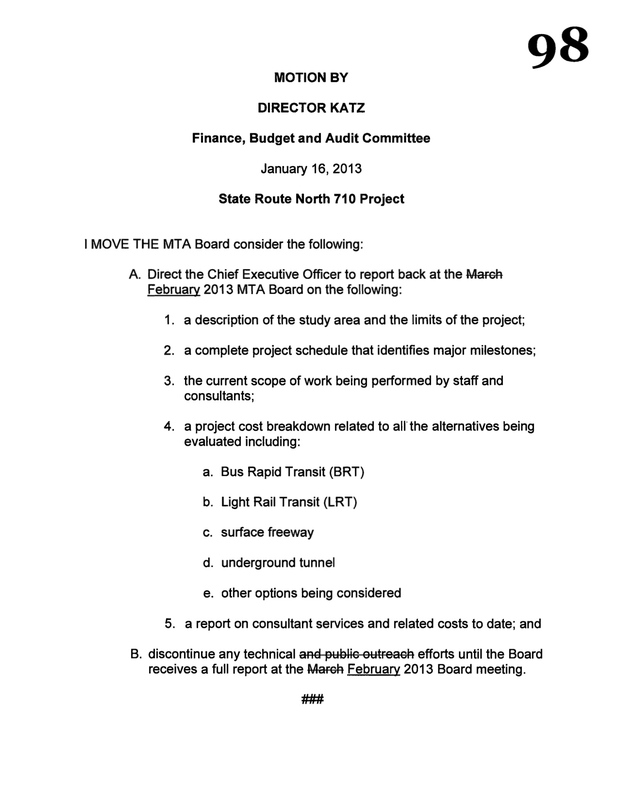 Above is a related item: a motion by Metro Board Member Richard Katz that will be considered at Thursday's meeting of the full Board. The AA has limited information on project costs — found below in Appendix X of the AA (pdf). Metro staff have recommended five alternatives for further study in the next step, a draft environmental impact statement/report and the appendix has cost estimates for each: traffic system management improvements ($120 million), bus rapid transit alternative 6 ($50 million), light rail alternatives 4a and 4b ($2.425 billion and $2.6 billion) and freeway tunnel alternative 7 ($5.425 billion). The Measure R sales tax increase approved by Los Angeles County voters in 2008 allocates $780 million for the SR-710 project. Funding would need to be secured for any costs above that amount. As for the Katz motion, I expect there will be a discussion at the Board meeting on Thursday, which we'll report here on The Source.